Preheat oven to 190°C/375°F. Add juice of half of lemon to a large bowl of water. Remove outer leaves of artichokes until you reach the pale yellow center, periodically dipping the artichoke into the lemon water to prevent browning. Peel base and stem of artichoke, then slice off the top third of the artichoke leaves. Slice in half, then use a spoon to scoop out the fuzzy center and purple prickly leaves. Slice halves into thirds. Peel and crush garlic, slice other half of lemon, and halve tomatoes. Pat chicken legs dry with a paper towel, then season with salt and pepper. Heat a large ovenproof frying pan over medium-high heat. Add olive oil and chicken and cook until browned on all sides. Transfer to a plate. Add artichokes and garlic to the same pan and sauté until golden brown. Add tomatoes and red pepper flakes and stir for approx. 1 more min. Deglaze with wine, then add olives, rosemary, and oregano. 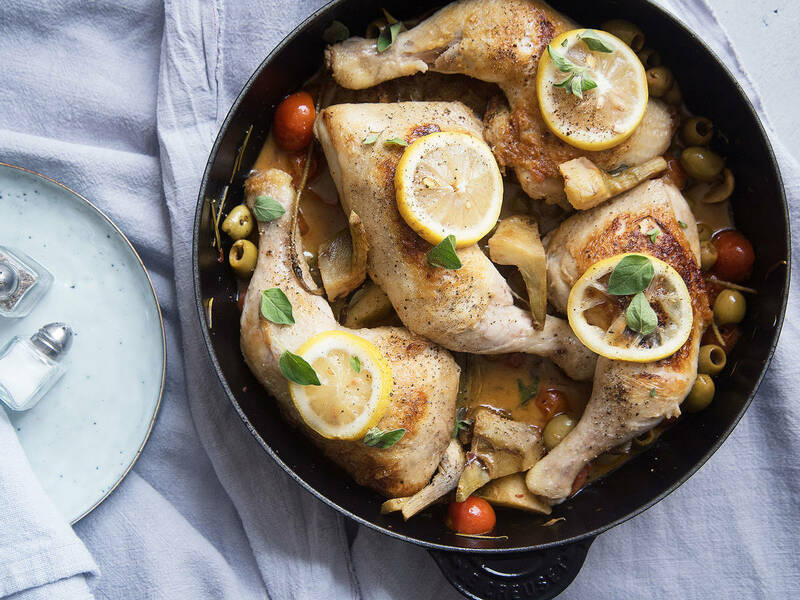 Return chicken to pan, top with lemon slices, and bring to a simmer. Cover pan with lid and transfer to oven. Cook at 190°C/375°F until chicken is cooked through and tender, approx. 30 min. Transfer chicken to a plate, then return pan to stove and simmer sauce over medium-high heat until thickened slightly, approx. 3 min. Stir in butter. Return chicken to pan and season to taste with more lemon juice, salt, and pepper, if desired. Garnish with oregano. Enjoy!